Vietnamese and native cultures are strong points of the Mekong Delta tourism that have attracted a great number of visitors per year. However, the delta region hasn’t got a prominent role on the national tourism map yet. The Mekong Delta is a multi-cultural, multi-ethnic and multi-religion region with innumerable festivals all year round. Festivals, floating markets, specialties, Dan ca tai tu Nam bo (Southern amateur music), exuberant orchards, immense rice fields and many islets along the Hau Rivers are appealing tourist attractions of the land. In addition, the flood season is also a character of the South. During this time, fields are submerged in water. Farmers temporarily set aside their farm work and turn to catching fish to make a living. 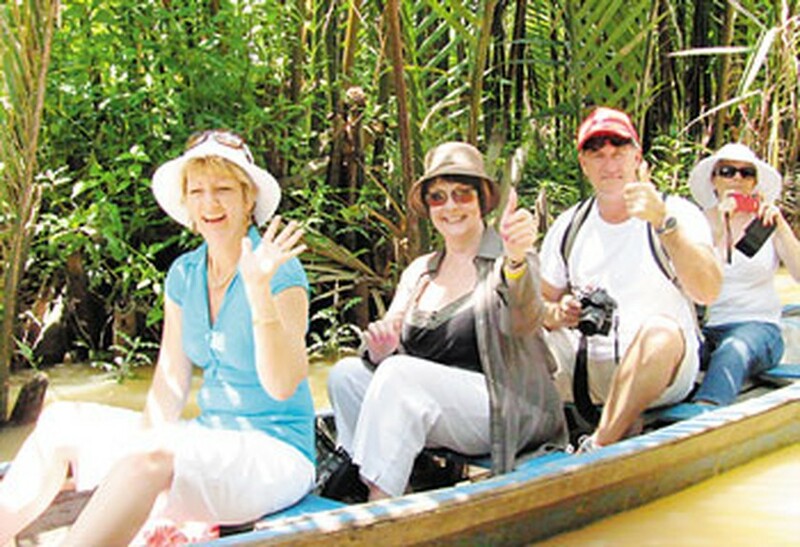 Tours to the Mekong Delta on this occasion have appealed many overseas Vietnamese, said deputy director of Ben Thanh Tourist Company Nguyen Minh Quyen. Cultural and Sport Festival in the flood season in An Giang Province has been recently a flourishing season of the tourism industry, he added. However, the local authorities have been only interested in exploiting the natural resources, not trying to create new tourist services and products. They have also indeliberately lost advantages of the region. 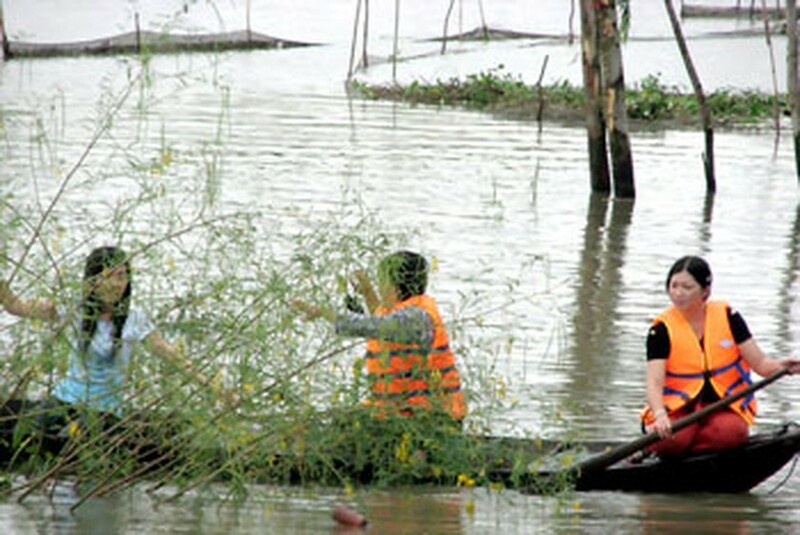 Visitors pluck dien dien flowers on river in the flood season. As an example, Nga Bay (seven-way intersection) hundred-year-old floating market in Hau Giang Province was closed because it caused traffic jams and pollution. Meanwhile the floating market’s beauty inspired the French captain of the famous Calypso ship, Jacques Yves Cousteau (1910-1997) to made a documentary film in 1992 that was broadcast on more than 100 TV channels throughout the world. In fact, legends, traditional festivals, habits and customs, daily activities of people in the area are special tourist products. In related news, documents on don ca tai tu (southern amateur music) are being compiled for submission to UNESCO to be recognized as a world intangible cultural heritage. The local authorities of Mekong Delta provinces have to cooperate with cultural experts to preserve and develop their traditional cultural values to create tourist characters. They should also concentrate in training more tourism staff, promote and diversify tourism products. 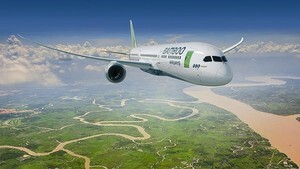 To meet traveling demand on long holidays on occasion of Reunification Days April 30, Bamboo Airways will open three international flight routes to South Korea, Taiwan (China) and Japan in April.